As America’s only accredited institution of higher education founded by Ukrainian Catholic Sisters, Manor College has a strong sense of obligation to take a position on recent and ongoing global events. If we collectively, as a Ukrainian-American community, do not stand by the foundations of our heritage and values, who will? In March 2014, Russia invaded Crimea in Ukraine when there was an existing disruption to stability; a Revolution of Dignity. Russia annexed Ukraine’s Crimea as their own, and Ukrainians and Crimean Tatars who have opposed Putin’s actions have been persecuted ever since. Invading Ukraine was a cowardly thing to do. When America bombed Syria’s chemical weaponry, Putin said that it was an “aggression against a sovereign nation.” How hypocritical! As an institution of higher education, it is important to clarify that all Russian people are not any more to blame than all Americans might be blamed for our own national transgressions. The issue taken is predominantly with a state usurped by one person. Putin’s hypocritical, self-serving, morally empty political posture is a threat to the world, and we must support the American interest in global peacekeeping. 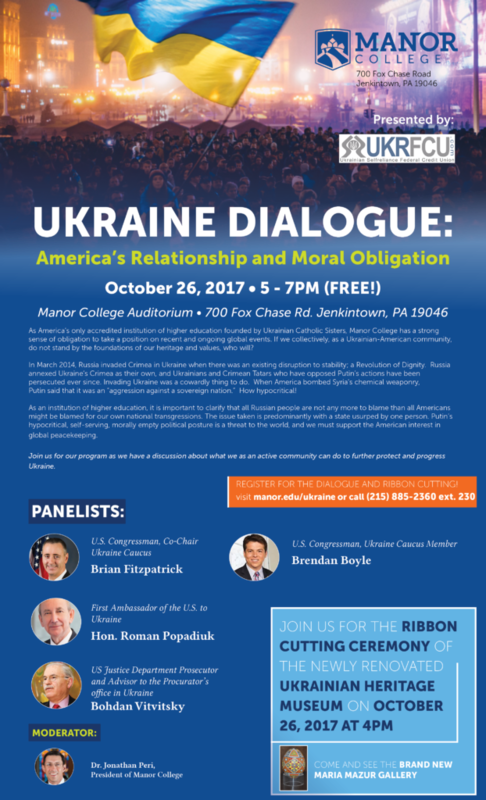 Join us for our program as we have a discussion about what we as an active community can do to further protect and progress Ukraine. COME AND SEE THE BRAND NEW MARIA MAZUR GALLERY AND MUCH MORE!